Quite by accident, the other day I discovered where the deer bed down when they take a break from their deer business. We were scootering, and the dogs were getting tired so I took a shortcut back to the car on the main park road. 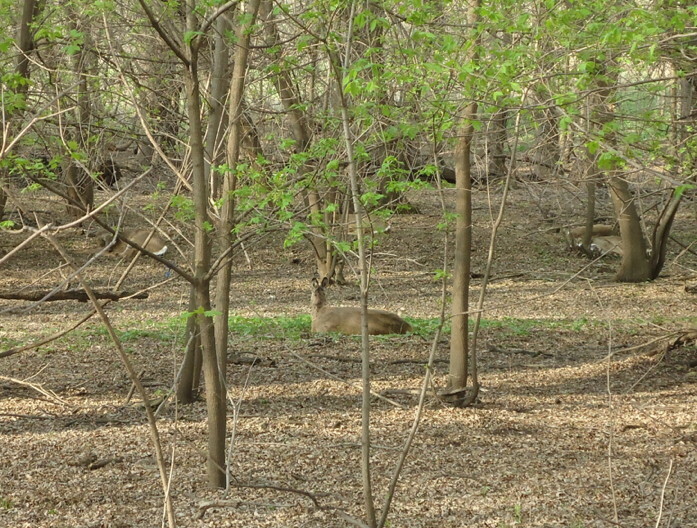 As I was looking around, my eye just happened to fall upon a doe resting in the leaves. Since the dogs were tired, they were trotting at a fairly slow pace and I got a good enough look to see there were actually 6-8 does bedded down in the same area of woods. Fortunately, the park deer are acclimated enough to people that they realize it’s not worth their while to get up from digesting their morning meal for every single gawker and passerby, and they just stayed put, watching me watch them while the dogs failed to notice their existence. I expect it won’t be long before the undergrowth is too dense to see them at all anymore. I don’t know why, but I really love this picture. Their harnesses look crappy and they’re not even lined out properly, but there’s just something about it that evokes a mood of everything I love about mushing. They’re done with their pre-run water, ready and eager to go out, and almost look like they’re contemplating deep thoughts. This was taken during canicross, not scootering. This is one of those moments that doesn’t photograph well, I wish I’d been taking video. 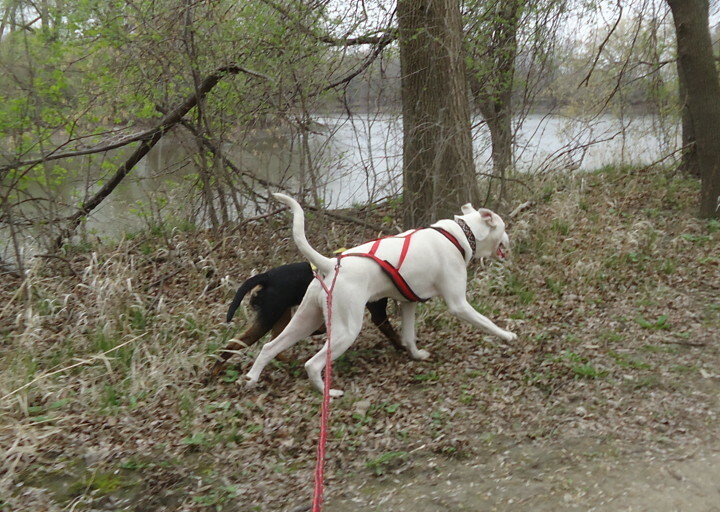 Squash was being silly and distracted and running off the trail when Maisy shouldered her way in between him and what he was trying to get at and literally shoved him back on track. He’s almost twice her weight, but she knows how to check him like an NHL enforcer. I guess it’s her way of saying ON BY ON BY! and is part of what makes her such a fantastic partner for him. 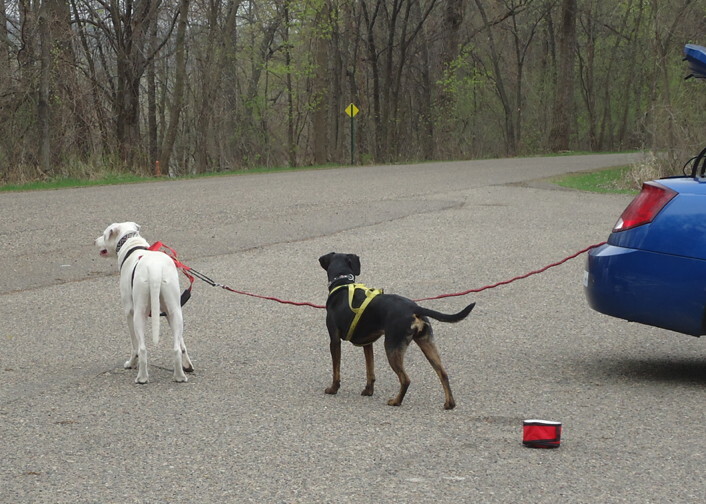 And lastly, Maisy answers the question “but do the dogs like scootering?” rather definitively, I think. This entry was posted in Dog Talk, Scootering. Bookmark the permalink.